At Colonel Landscaping, we know that springtime is the perfect time for our professional mulching services. Our residential and commercial clients rely on our innovative bark blowing capabilities to add a well-manicured look to their backyard or business site – it's the perfect finishing touch to get your property ready for everything the warmer months have in store for us here in Connecticut. Yes, our premium quality, organic mulching products look amazing. Mulch proves a powerful weapon in the war on weeds. Colonel Landscaping's mulch is blown in through a hose for consistent, protective coverage that prevents sunlight from penetrating through to weeds lurking just below your topsoil. Colonel Landscaping's bark blowing service doesn't just control weeds; it can also control pests throughout your lawn and gardens. Certain types of mulch, such as cedar back, contain natural oils that repel insects for added protection. Mulches made from organic materials absorb water and limit evaporation potential. Increased water retention in the soil can help sustain vegetation during our drought season and often results in less watering throughout the summer. You may actually notice a positive difference in your water bill this year. Mulch acts like a protective barrier that keeps rains and winds from washing soil away. Earthworms enrich the soil and improve the distribution of critical nutrients. Colonel Landscaping's organic material mulch encourages earthworms to move into your beds and gardens for long-term benefits. Colonel Landscaping's mulch insulates the soil, protecting trees, plants, flowers, and shrubs from both low and high Southern New England temperatures. Don't waste time and energy spreading mulch by hand this spring. Partner with Colonel Landscaping's skilled and qualified team of professional landscapers for affordable mulch delivery & installation services that beautify, strengthen, and protect your yard. Our state-of-the-art machinery blows your mulch through a hose for precision placement throughout your lawn and gardens. Not only is our bark blowing fast and efficient, but it also has a minimal impact on your property. 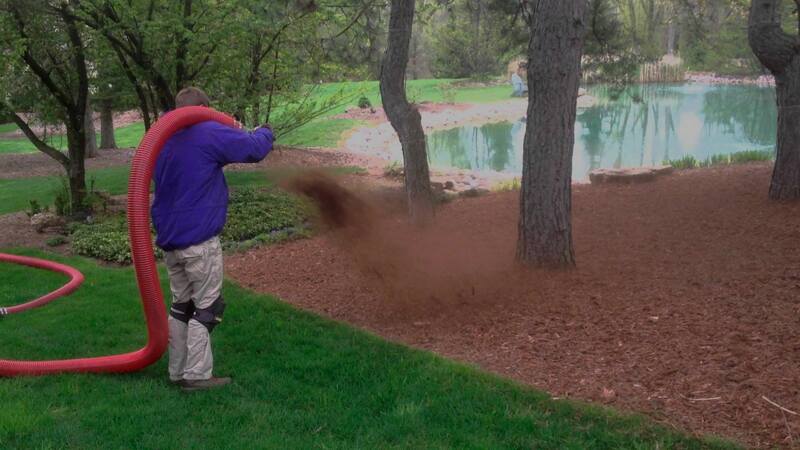 We carefully spread mulch in designated areas without disturbing other features in your yard. Most importantly, Colonel Landscaping takes the guesswork out of mulching. No worrying about buying too much, too little, or not using the right option for your property. We'll consult with you every step of the way to choose the right product and pinpoint exactly how much you'll need for your outside beds and gardens. Ready to get on our spring mulch schedule? Contact the Colonel Landscaping team today!